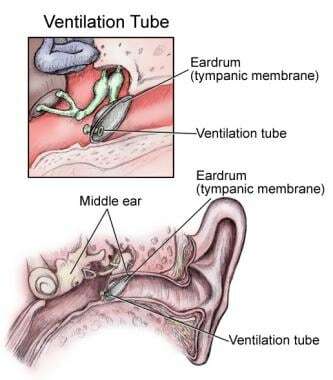 Ear tube insertion, also known as tympanostomy tube insertion, is the placement of a pressure equalizer tube into the tympanic membrane (see the image below). [1, 2] This surgical procedure treats middle ear fluid, which, when it persists in the middle ear space, can cause otitis media (acute or chronic) in addition to hearing loss. Ear tube in position in eardrum. The first plastic ventilation tube was introduced by Beverley Armstrong in 1954, during the advent of the antibiotic era; a variant of this tube is still used today. The plastic grommet was fashioned to remain within the tympanic membrane and prevent the quick closure of a myringotomy incision. Grommets are small and well tolerated by the tympanic membrane, and they can maintain a ventilatory port for the middle ear space for approximately 1-2 years. In the United States, ear tube insertion is the most frequently performed otologic surgical procedure in children. Various different sizes and shapes of ear tubes are available, selected by the surgeon on the basis of the underlying pathophysiology, the tube's specific characteristics, the number of previous sets of tubes, and the surgeon's preference. Alternatives to ear tube insertion are myringotomy and tympanocentesis. The ear is composed of external, middle (tympanic) (malleus, incus, and stapes), and inner (labyrinth) (semicircular canals, vestibule, cochlea) portions. The auricle and external acoustic meatus (or external auditory canal) compose the external ear. The external ear functions to collect and amplify sound, which then gets transmitted to the middle ear. The tympanic cavity (middle ear) extends from the tympanic membrane to the oval window and contains the bony conduction elements of the malleus, incus, and stapes. The primary functionality of the middle ear is that of bony conduction of sound via transference of sound waves in the air collected by the auricle to the fluid of the inner ear. The inner ear, also called the labyrinthine cavity, is essentially formed of the membranous labyrinth encased in the bony osseus labyrinth. The labyrinthine cavity functions to conduct sound to the central nervous system as well as to assist in balance. The most common indication for ear tube insertion remains persistent (> 3 mo) otitis media with effusion (OME), or serous otitis media (SOM), that does not resolve after 3 months of clinical observation or does not improve with antibiotic therapy. A clinical practice guideline from the American Academy of Otolaryngology-Head and Neck Surgery Foundation states clinicians should recommend tympanostomy tubes when surgery is performed for OME in a child 5 </ref>Ear tube insertion promotes drainage of middle ear fluid, which can cause speech and language delay if left untreated for a prolonged period. Middle ear fluid also predisposes to recurrent infections. Another indication for ear tube insertion is acute otitis media (AOM) that is refractory to antibiotic therapy. In persons who do not tolerate antibiotic therapy well, ear tube insertion allows egress of middle ear fluid (purulent, serous, mucoid) and permits easy delivery of topical antibiotic drops to the middle ear space. Additional indications for prompt ear tube insertion include complications of AOM, such as meningitis, facial nerve palsy, and otomastoiditis. In patients with these complications, ear tubes can help halt tympanic membrane injury (eg, from retraction pockets, which distort the eardrum, and the subtle process of adhesive otitis media, which limits ossicular vibrations and can lead to permanent hearing loss). Prompt insertion of tympanostomy tubes ventilates the middle ear space and prevents further retraction of an eardrum under the negative pressure. Overall, 80% of children requiring ear tubes need 1 set of ear tubes. In children with ear tubes, episodes of otitis media are less frequent and are more readily treated with antibiotic ear drops. Paradise's long-term study of a small cohort of children with OME did not show an overall improvement with respect to developmental outcomes in children who received tubes more promptly at age 3 years, regardless of baseline hearing. However, this study did not examine individual improvements or improvements within more handicapped populations. Institutional protocols should be followed regarding verification of the procedure and the patient. An appropriate workup should be carried out, as follows. An audiogram is often obtained before the procedure to assess the degree and severity of hearing loss. If a patient reports normal hearing and has a normal audiogram before the procedure, a repeat audiogram after ear tube insertion is not imperative. Pneumatic otoscopy is the primary diagnostic method for otitis media with effusion (OME) and helps distinguish this condition from acute otitis media (AOM). Tympanometry (tympanography) can be done to confirm the diagnosis of OME. In addition to pneumatic otoscopy and tympanometry, skilled examination of the tympanic membrane under a microscope remains the best clinical way to diagnose other types of otitis media. Imaging and laboratory studies are generally helpful for complications of AOM but are not indicated in most chronic cases of OME. When computed tomography (CT) of the temporal bone and head is done in the setting of mastoiditis, the images reveal whether the fluid is in the middle ear space and, more important, whether bone destruction within the mastoid region of the temporal bone is present; such destruction leads to expansion of infection into the cranial vault, the meninges, the temporal lobe region of the brain, or the periauricular regions of the pinna and neck or scalp. Different types of ear tubes. Ear tube insertion is performed with general anesthesia in children and local anesthesia in adults. General anesthesia is induced via mask ventilation. The patient is supine, with the head positioned square to bed and then rotated laterally, with the nose about 30-45º away from vertical. Patients who undergo ear tube placement should be followed every 6–12 months until the tubes have extruded and episodes of otitis media have resolved. Tubes that that do not extrude within 2-3 years should be removed with the patient under general anesthesia. An operating microscope with a 250-mm lens is brought into the field and focused on the external auditory meatus. An oval 4-mm speculum (eg, Gruber type, of a size appropriate for visualizing the tympanic membrane) is placed into the external auditory canal, and the cerumen is removed so that the entire tympanic membrane can be visualized. The anterior half of the eardrum is then visualized, with the tympanic annulus anterior and the umbo posterior. A horizontal incision is placed over the region of the middle ear, most commonly in the anteroinferior quadrant. It should be deep enough to incise the eardrum but not so deep that it injures the middle structures. The incision may have to be slightly smaller than the diameter of the tube’s inner flange. The knife incising all layers of the eardrum should be placed in the center of the field of vision to leave sufficient room for visualizing the insertion of the tube. If an effusion is present, a 3, 5 or 7 French Baron suction cannula, with or without saline irrigation via an angiographic catheter, is employed. Large (7 French) suction cannulas are essential for removing the thick inspissated fluid that is frequently present in chronic otitis media with effusion (OME). An Armstrong beveled grommet tube is introduced by holding the posterior surface of the inner flange with small alligator forceps. The tube is then passed through the speculum to the anterior-inferior canal; the anterior surface of the flange is inserted into the drum. If necessary, insertion is completed with a curved or straight pick. Most tubes can be inserted directly with small alligator forceps. T-tubes, being generally longer-lasting than other types, are commonly chosen for long-term placement. Long-term tube placement proceeds in the same manner as short-term tube placement, up through the myringotomy and the placement of the cannula (if necessary). The leading flange of the T-tube is held close to the tip with an alligator forceps, then inserted into the myringotomy until the base of the T-tube stem reaches the hole (see the video below). Paparella No. 2 tubes are also helpful. Myringotomy and ear tube placement. Video courtesy of Hamid Djalilian, MD. Video of ear tube insertion. Antibiotic ear drops are prescribed for 3-7 days to treat middle ear inflammation and maintain ear tube patency. Cotton RT, Gluckman JL. Seiden AM, Tami TA, Pensak ML. Otolaryngology: The Essentials. 1st Ed. Thieme; 2001. Jafek BW, Murrow BW. ENT Secrets. 3rd Ed. Mosby; 2005. Rimmer J, Giddings CE, Weir N. History of myringotomy and grommets. J Laryngol Otol. 2007 Oct. 121(10):911-6. [Medline]. National Collaborating Centre for Women's and Children's Health. Surgical management of otitis media with effusion in children. 2008. Available at http://guidelines.gov/content.aspx?id=14314. Rosenfeld RM, Shin JJ, Schwartz SR, Coggins R, Gagnon L, Hackell JM, et al. Clinical Practice Guideline: Otitis Media with Effusion (Update). Otolaryngol Head Neck Surg. 2016 Feb. 154 (1 Suppl):S1-S41. [Medline]. Paradise JL, Dollaghan CA, Campbell TF, et al. Otitis media and tympanostomy tube insertion during the first three years of life: developmental outcomes at the age of four years. Pediatrics. 2003 Aug. 112(2):265-77. [Medline]. Maw R, Wilks J, Harvey I, Peters TJ, Golding J. Early surgery compared with watchful waiting for glue ear and effect on language development in preschool children: a randomised trial. Lancet. 1999 Mar 20. 353(9157):960-3. [Medline]. Anari S. A simple technique for tympanostomy T-tube insertion. Clin Otolaryngol. 2008 Jun. 33(3):296-7. [Medline]. Ah-Tye C, Paradise JL, Colborn DK. Otorrhea in young children after tympanostomy-tube placement for persistent middle-ear effusion: prevalence, incidence, and duration. Pediatrics. 2001 Jun. 107(6):1251-8. [Medline]. Otitis media with effusion. Pediatrics. 2004 May. 113(5):1412-29. [Medline].